Do you ever wonder about the air quality in your home? I do because I happen to live right near a major highway. I wanted to know how healthy the air is inside my home so Foobot graciously allowed me to test their Foobot air quality monitor. 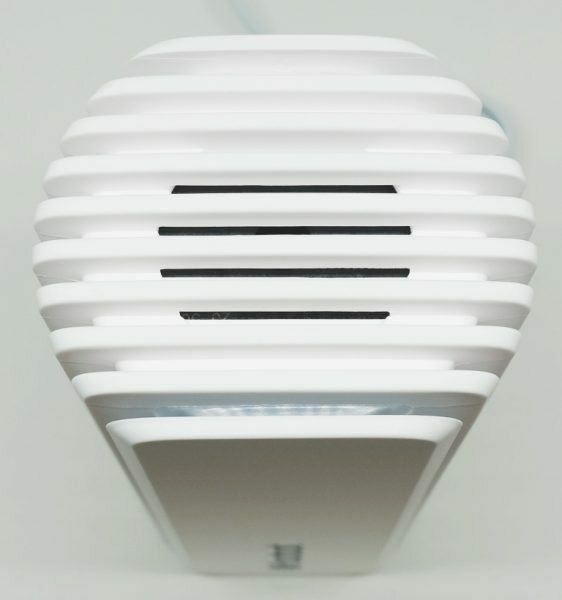 In a nutshell, the device lumps air quality into two major categories: volatile organic compounds detected in the air (VOCs) and particulate matter detected in the air (PM2.5) measuring as little as 2.5 micrometers in diameter. I discovered some interesting air quality trends in my home which allowed me to open up some windows to ventilate it. I was hoping that the Foobot monitor would allow me to determine the amount of carbon monoxide in the air but it unfortunately lumps this in with the VOCs. 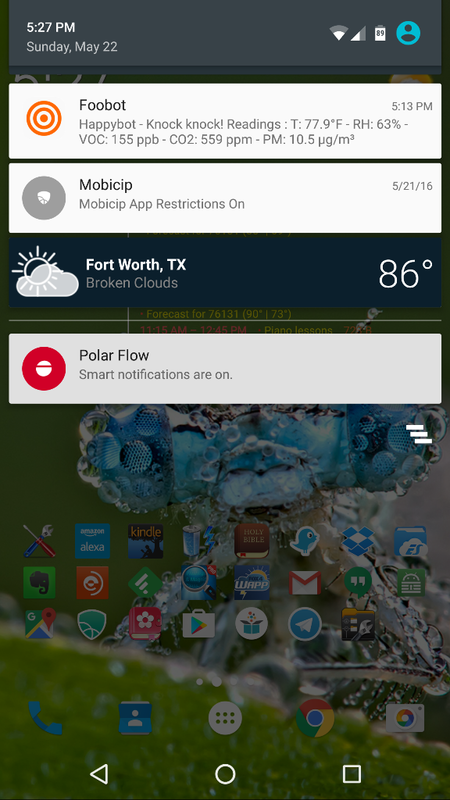 However, the Foobot does have some cool added features like working with IFTTT, Nest thermostat, and Amazon Echo. The Foobot is a simple device made up of several white plastic panels layered on top of each other. 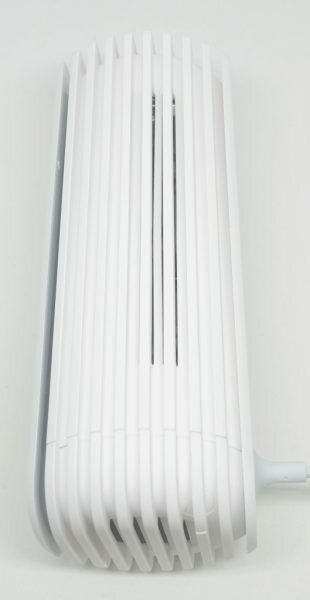 Behind the first panel is a plastic ring of LEDs that when the device is plugged in, will illuminate blue or orange to help you determine at a glance when you have good (blue) or bad (orange) indoor air quality. The top of the device has vents to allow air to pass through to access the internal sensors for VOCs or PM2.5. One side of the device also has air vents. Yet, the other side does not. 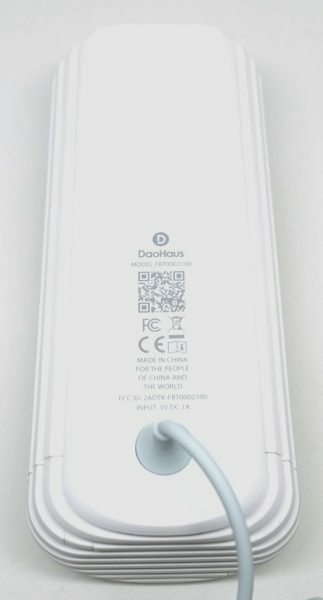 The back of the Foobot contains basic information about it and a QR code to download the Foobot app. The bottom of the device also has air vents to allow access to the sensors. When setting up the Foobot, you need to install the Foobot iOS or Android app. The app steps you through the process of setting up your Foobot. 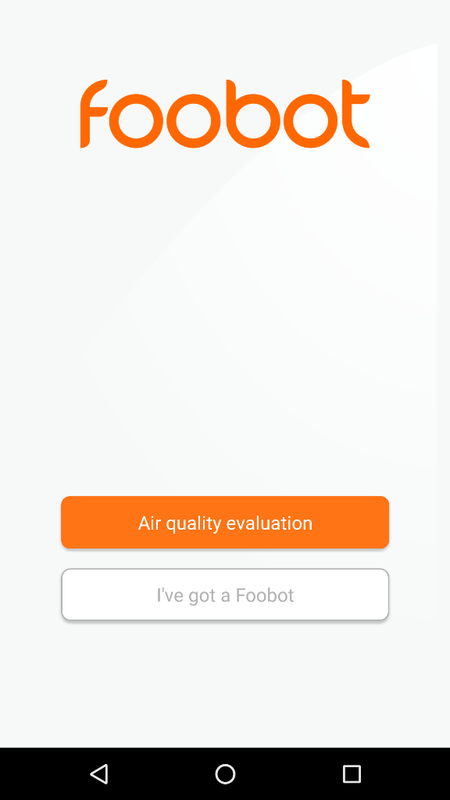 When you open the app, you have two choices: “Air quality evaluation” or “I’ve got a Foobot”. If you do not have a Foobot air quality monitor, the “Air quality evaluation” selection asks you several questions to help you evaluate your air quality and then offers suggestions on how to improve it. 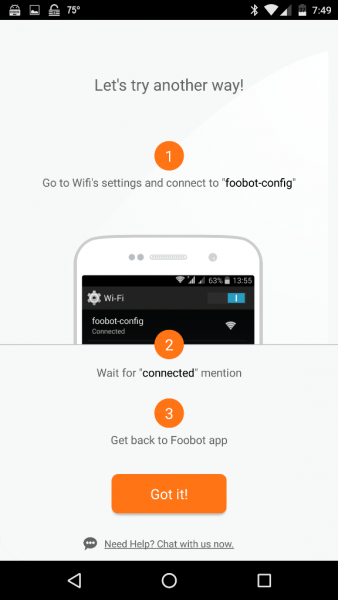 The “I’ve got a Foobot” selection allows you to either set up a new Foobot or log into your Foobot. 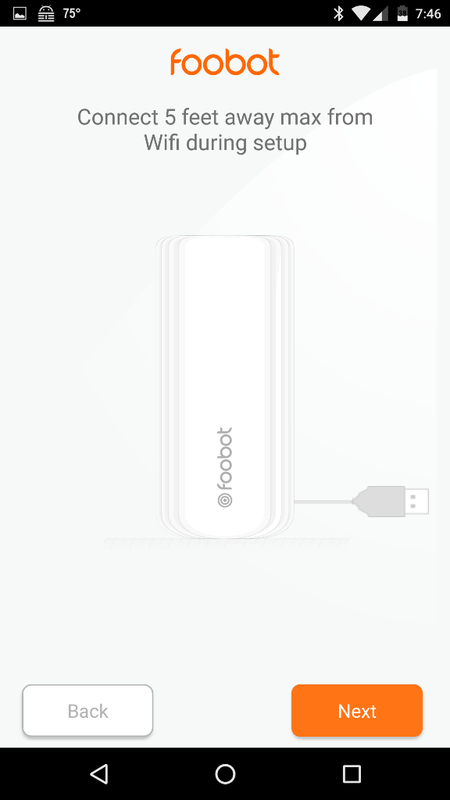 When starting the setup process, the instructions suggest that I should be within five feet of my WiFi thus, I used the AC plug that is permanently attached to the Foobot to plug my Foobot in right next to my router (there is no Ethernet port on the Foobot since it is a WiFi device). After plugging it in, I needed to turn it upside down so that the logo was oriented in an up position. 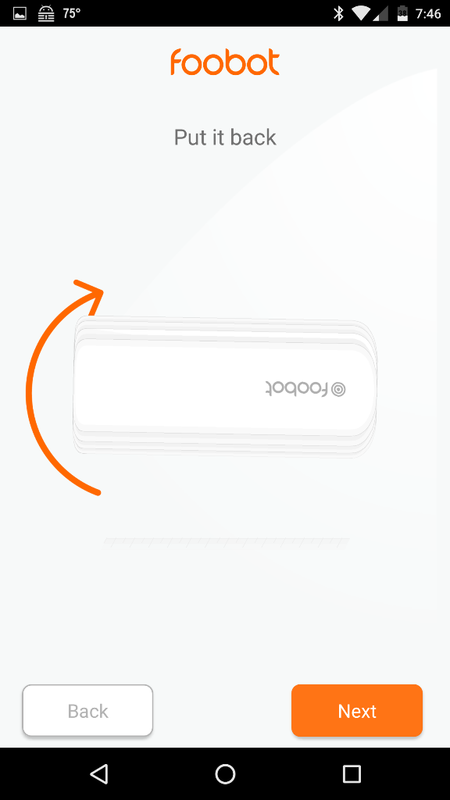 Once upside down, an orange light blinks quickly, after which you turn it right side up then enter your network password. We use the 5GHz band in our house almost exclusively, so I didn’t give it a thought that I would use it for the Foobot; however, the Foobot does not work on this band so I was unable to connect it on my first couple of attempts. 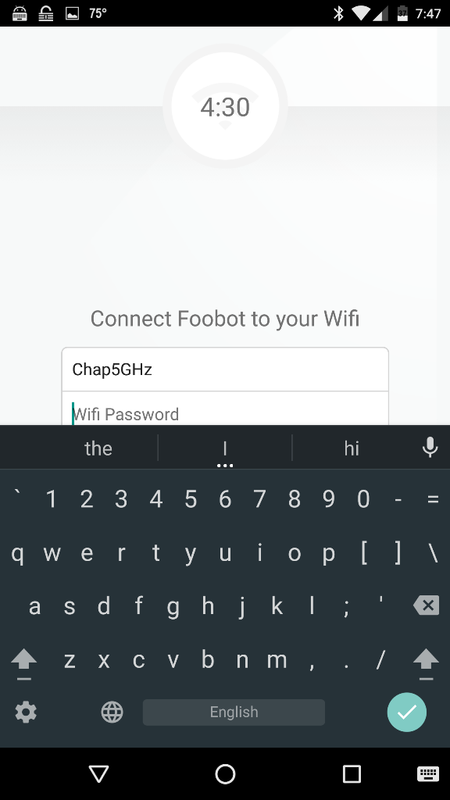 After being informed by Foobot support that it only works with the 2.4GHz band, I entered my 2.4GHz network password. The Foobot connected successfully to my WiFi network, which was indicated by the LED flashing blue five times. If the connection were not successful, the LED would have flashed orange five times. 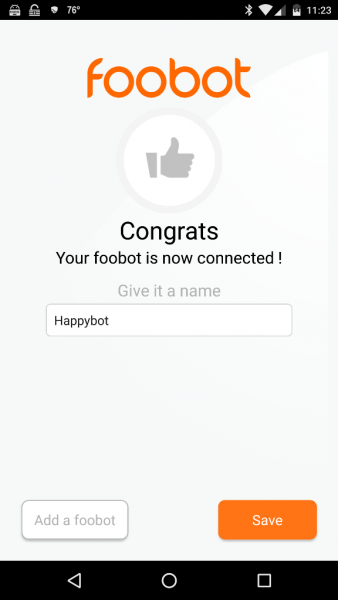 Once I was connected, I setup an account with a username and password, placed the Foobot in my kitchen (which is centrally located in the open living areas of my home), after which my Foobot needed six days to calibrate itself to our environment. 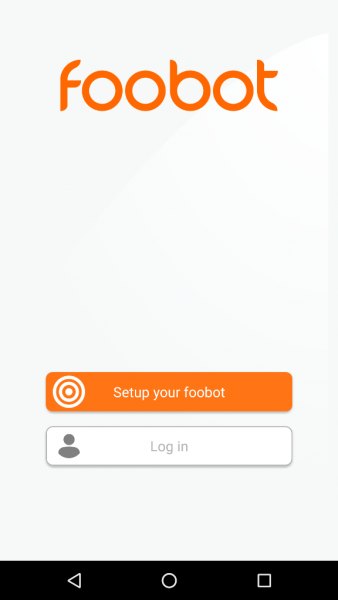 After calibration, when you open the Foobot app, you see the home screen which is the left screenshot above (both iOS and Android apps are very similar so most of my screenshots will be from my Nexus 6 phone). 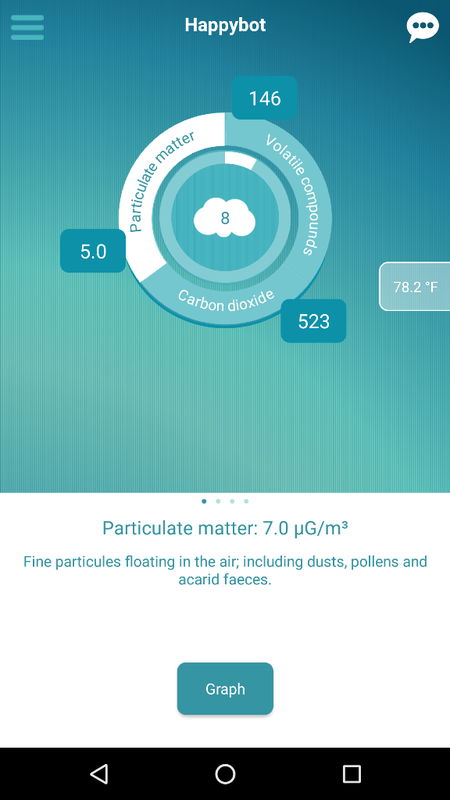 Tapping anywhere on the circle of information (“Particulate matter”, “Volatile compounds”, “Carbon dioxide”, or the cloud in the center of the circle which is the “Global Pollution Index”) brings up a popup screen with information about that particular factor measured by the sensors. 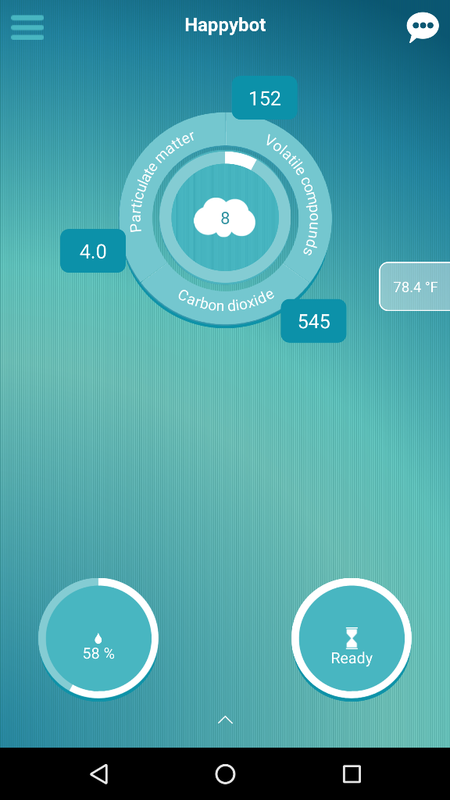 By tapping on the up arrow on the home screen of the app located at the center bottom of the home screen (see left screenshot above), you can observe the horizontal bar graph of individual sources of pollution (you may view a line graph by holding your iOS device in landscape position). 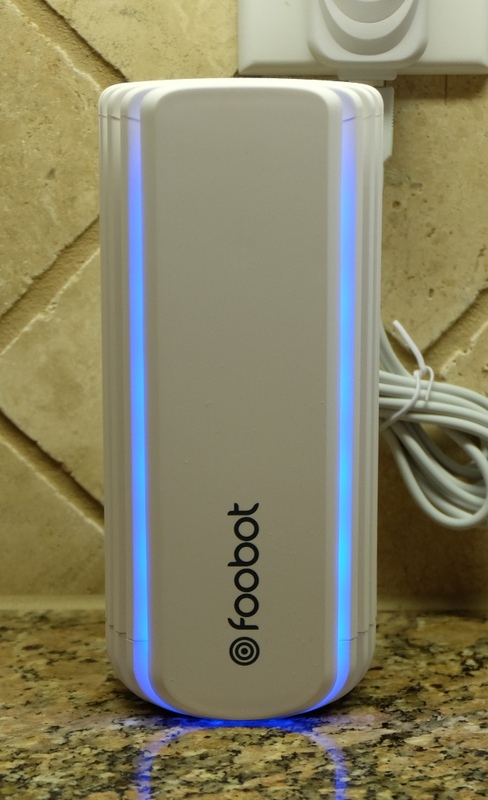 The Foobot records data by the minute, hour, day, and week so that you can view your indoor air quality trends over time. Thresholds are indicated by the vertical dashed line in the center of the screen. 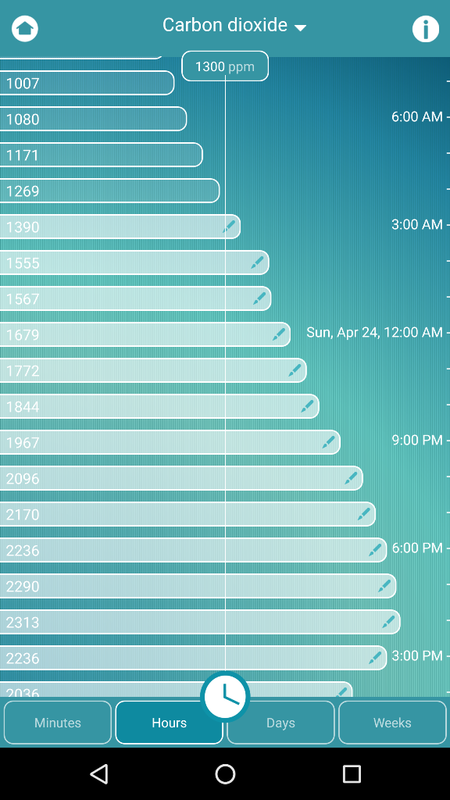 When the Global Air Index levels are under the thresholds, you will find that the backgrounds of the Foobot app screens are a blue color. The same is true of the LED on the Foobot device itself. If you wish to view other factors measured by the sensors, you may do so by tapping on the Global Pollution Index drop-down menu. 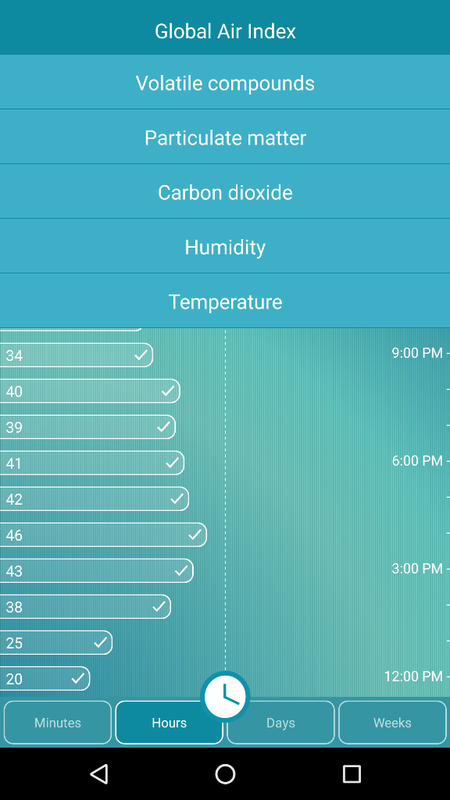 From there, you may select other measured factors to observe the graphed data (you can see the other selections like Volatile compounds, Particulate matter, Carbon dioxide, Humidity, and Temperature on the right screenshot above). Foobot measures pollution from two main sources: Particulate matter (PM2.5) and volatile organic compounds (VOCs) and the World Health Organization (WHO) determines the thresholds at which those pollutant levels are not safe. Particulate Matter are the fine particles in the air that include dust, pollens and acarids feces. Sources of particulate matter are from our vehicles, unfiltered vacuum cleaners, dead skin cells (which makes up most of the dust in our homes), and the products of combustion when cooking. Foobot can detect particles as small as 2.5 micrometers. The WHO has set the threshold for exposure to particulate matter at 25 micrograms per one cubic meter. This threshold is reflected in the Foobot app as the dashed verticle line in Particulate Matter graph. Volatile organic compounds are the gases that are emitted into the air from things like new furniture, paint, air fresheners, scented candles, dry cleaning, laundry products, perfumes, and cleaning products. Foobot measures VOCs in parts per billion (ppb) because some VOCs are dangerous even at very low levels. The WHO has set the threshold for exposure to VOCs at 300ppb which is also indicated as the dashed vertical line in the VOC’s graph. The default graph provides the data from the Global Pollution Index which “is a weighted compound of the different pollutants measured by Foobot” according to the Foobot website. If the pollution numbers exceed the threshold, the bars on the graph will look white instead of transparent as illustrated in the right screenshot above. This is true of the historical data. 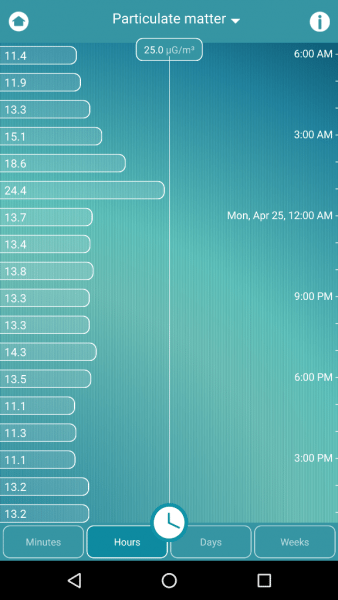 The left screenshot displays the Particulate Matter graph. The Foobot sensors are able to detect particle sizes as small as 2.5 micrometers. 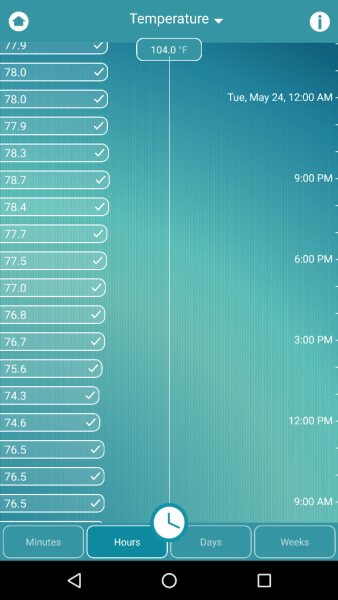 The right screenshot displays carbon dioxide measurements. Although carbon dioxide is not a pollution indicator, it illustrates how “stuffy” your house may be thus indicating that you may want to open some windows to ventilate your home. The humidity levels are tracked in order to assist you in determining whether the levels are high enough to promote mold growth. The Foobot also tracks temperature levels in your home. 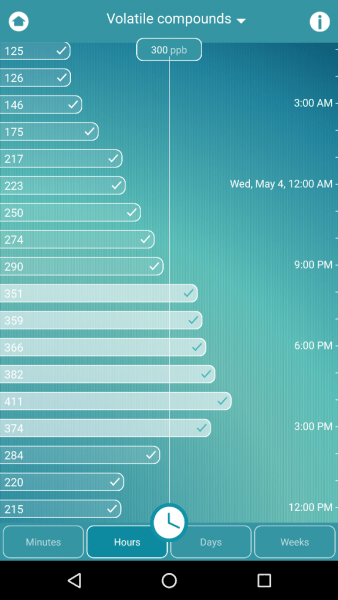 When Foobot detects a change in VOCs or PM, it will ask you to tag that event if you can identify the cause (shown in the left screenshot above). 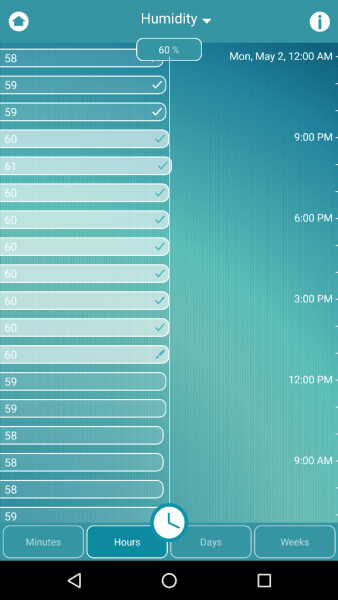 And if your current Global Pollution Index exceeds the threshold, the backgrounds of the Foobot app screens are orange indicating the current high levels of pollution. 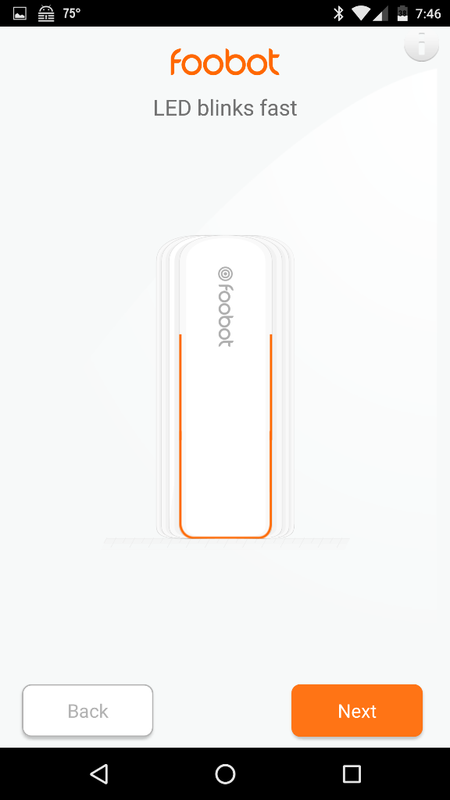 The Foobot device’s LEDs will also illuminate orange, giving you a quick indication that the levels are above safe thresholds. Each measured factor was above the threshold in this instance while I was cooking. The combustion from the gas cooktop we have contributes to the measured levels of pollution as well as what emanates from what you are cooking. Carbon dioxide and humidity levels increased as well while cooking. I’m hoping I never see the temperature within our house exceed the Foobot thresholds! When the Foobot detects an increase in one of the measured factors, it will send you a notification and ask you to identify it or tag it. 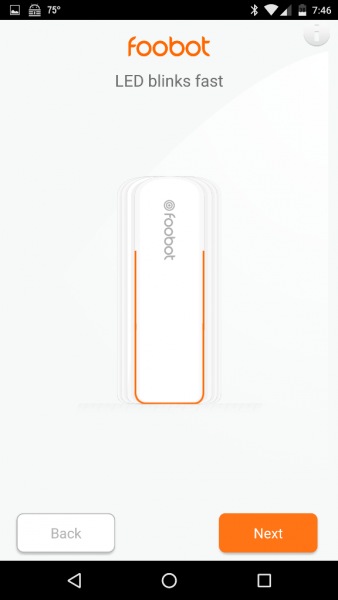 You may even tap twice on the Foobot device to send your phone a notification of the measured Temperature, Relative Humidity, VOCs, CO2, and PM at that instant (Foobot calls it a “Knock Knock” notification). 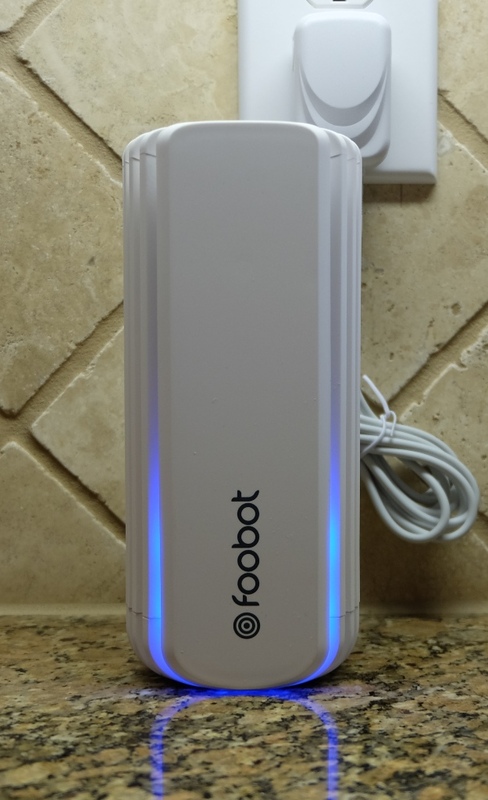 The Foobot device’s LEDs will give you a quick indication of the quality of your indoor air. Any of the blue LEDs means that your air quality is good and decreases with decreasing number of LEDs illuminated. 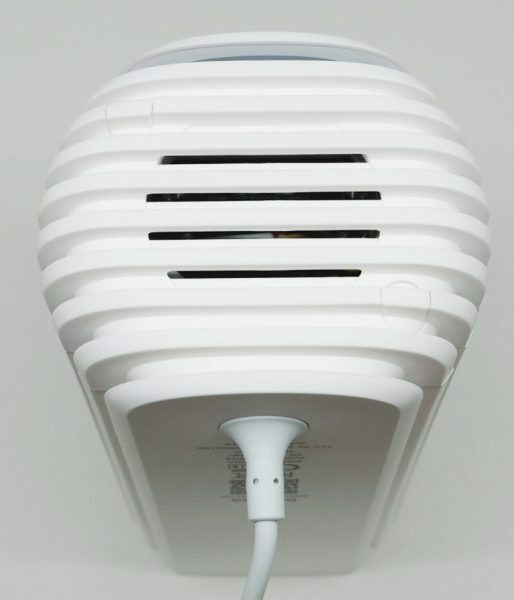 The orange LEDs indicate that your indoor air quality is increasingly bad with increasing number of illuminated LEDs. As I used the Foobot over the last few months I discovered some interesting air quality trends in our home. There was a trend in the late evenings for carbon dioxide and VOCs to increase in our home perhaps because we all gather in the living room area at night and the house has been closed up all day long; however, just after opening three windows in the area, levels went down almost immediately. In addition, sometimes when I was cooking, the VOC and CO2 levels and sometimes the PM levels all increased beyond threshold limits. However, there were other times that levels increased for no apparent reason. I also didn’t notice any changes when my Botvac vacuumed my home, when I dusted, or when I cleaned our bathrooms (but I do clean our bathrooms with vinegar and sometimes essential oils in addition to using bleach occasionally). I do not use air fresheners, but I do diffuse essential oils from our kitchen. Whenever my diffuser was on, there were no detectable changes according to Foobot readings. Over the last few months, Foobot has added functionality to its Foobot air quality monitor. 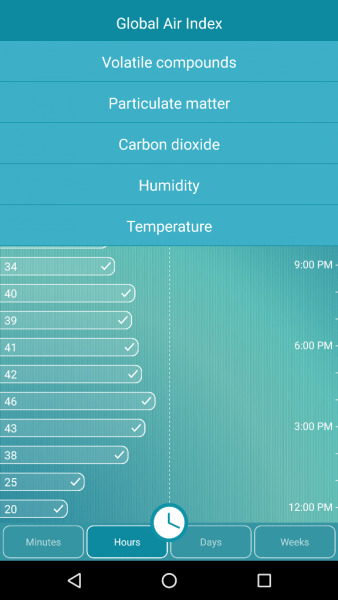 It now works with other services and devices like IFTTT (If This Then That), Breezeometer (detects outdoor air quality), Nest thermostat, and Amazon Echo. IFTTT is a service that allows you to connect services or devices (If “this happens” then “do that”). You can set up your own “recipes” as they are known in IFTTT to inform you of an event like an increase in pollution levels via email or text (e.g. If there is an increase in VOCs then send me an email). You can even create a recipe that will send data every five minutes to a Gmail spreadsheet to track pollution trends in your home. I succesfully used a recipe that sent me an email that contained a summary of measured information about my air quality at a particular instant (I wanted an email sent to me with the information from the “Knock Knock” notification). 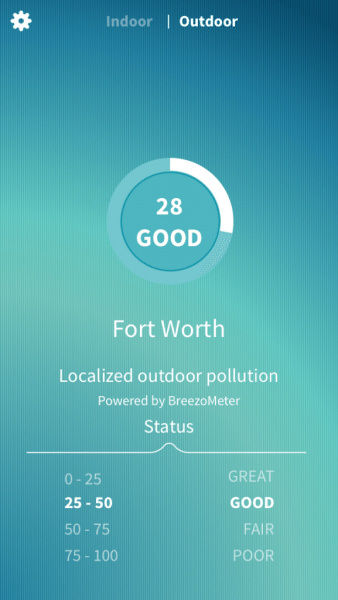 In May, the Foobot iOS app started revealing the outdoor pollution levels (thanks to BreezoMeter) as well as indoor levels – don’t worry Android users, they are working on the Android app now to do the same. I found this to be very handy because I live right next to a major highway and I’m about 15 minutes away from downtown Fort Worth which means we periodically have outdoor air quality warnings. In addition, by comparing indoor and outdoor air quality readings, I was also able to see that most of the time our indoor air quality was better than that outside, which was encouraging. As of June, Foobot also works with the Nest thermostat so that “as soon as the indoor pollution rises above the threshold (represented above by the dotted line), then Foobot will tell Nest to boost the air renewal” according to the Foobot website. I do not have a Nest thermostat but now I really want one to test this seemingly highly useful feature. 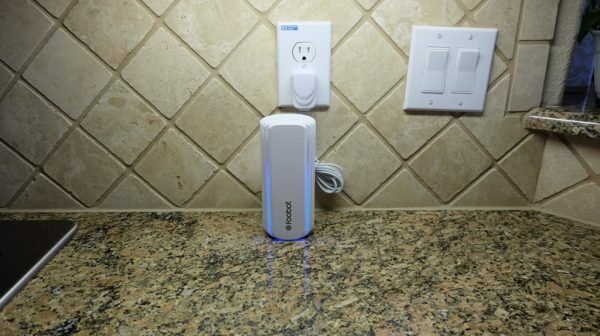 In addition, as of June, Foobot now works with Amazon Echo so that after linking the Echo with the Foobot, you may ask Alexa to report the air quality of your home. After linking my Echo Dot with the Foobot, I was able to succesfully ask Alexa to report about the air quality in my kitchen which is useful in cases when I can’t see my Foobot and don’t have access to my phone to study the Foobot app. 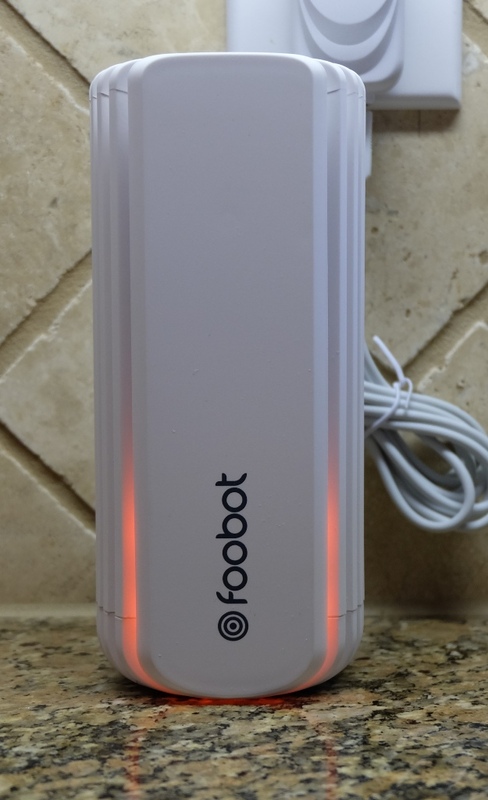 The Foobot indoor air quality monitor is a great monitoring tool for reporting the elevated levels of volatile organic compounds (VOCs) or particulate matter in the air (particles as small as 2.5 micrometers) in your home. You can tell at a glance whether or not your air quality is good or bad by the color of the Foobot device’s LEDs (blue = good, orange = bad) or you can observe the actual data of the measured factors within the Foobot app. I was hoping that there was a dedicated sensor and measurement for carbon monoxide but it is instead lumped in with VOCs. It was interesting to see the trends in our home’s air quality in order to mitigate the problems effectively (opening windows, burn less scented candles, etc.). Initially, I wasn’t too terribly impressed with Foobot, but since the time I first received the Foobot, they have added a great deal more functionality – it now works with IFTTT, provides outdoor air quality measurements (thanks to Breezeometer), works with Nest thermostat and Amazon Echo – and they seem to be working on adding more features. This is what I personally get excited about. Since hearing that the Foobot works with the Nest thermostat, I have a drive to get a Nest so that I don’t have to run around my house to open windows to ventilate my home! 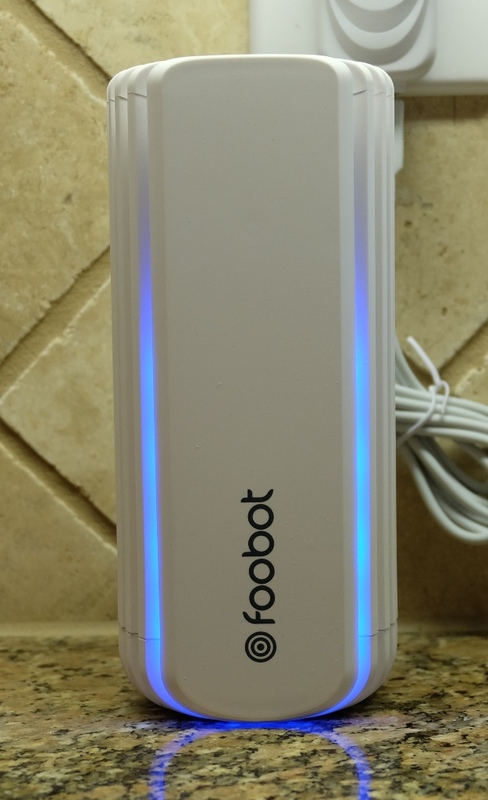 I have been using the Foobot for two years now and I enjoy seeing the quality of my indoor air. Before I had this device, I remember having heard that sometimes, indoor air quality is worse than outdoor air quality. 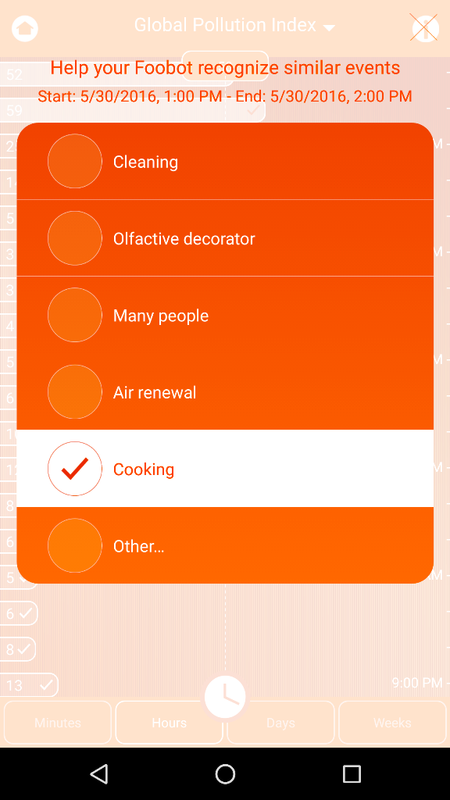 Since I’ve had the Foobot, I can say that my indoor air quality is always much better than that of the outdoors thus indicating that I do not have to open windows to ventilate my home. I think it’s because I have a lot of indoor plants! I would still really like to see it monitor cabon monoxide levels in my home. Source: The sample used in this review was provided by Foobot. 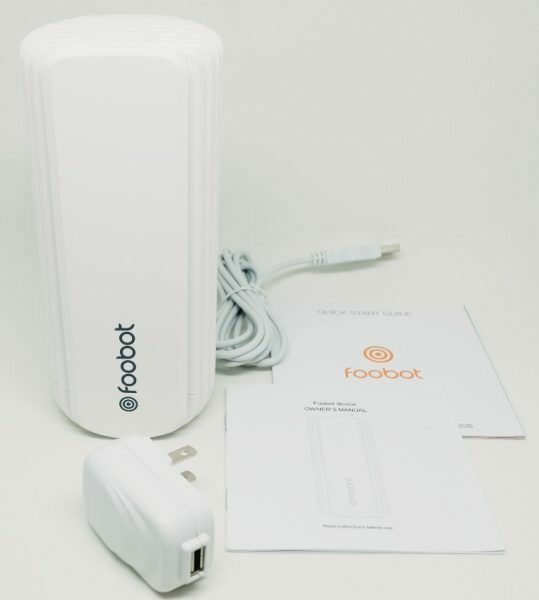 Please visit the Foobot website for more information or Amazon to purchase one for yourself. Kathleen has always enjoyed technology and the sciences (biology and entomology). She's worked as a research technician and an end user services tech before becoming a stay-at-home mom and home educator. Her continued interest in technology led her to join the Gadgeteer team in 2014. LOVE my FooBot. Heard all about it from https://www.youtube.com/watch?v=cuBXw_lMmVY and knew I wanted one. It came a week later and works great!